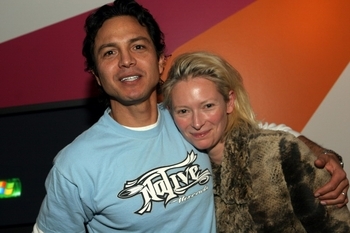 Ziamond Cubic Zirconia Jewelers and Benjamin Bratt with Tilda Swinton view the collection of 14k, 18k and platinum jewelry. Ziamond sets its cubic zirconia jewelry in the same diamond mountings and settings which are the same designs used to set real diamond jewelry. Our jewelry designs include rings, engagement rings, wedding rings, wedding bands, solitaires, pendants, necklaces, bracelets, earrings, mens rings, mens jewelry, cufflinks and other pieces of fine quality jewelry. Ziamond cubic zirconia cz stones and man made gems are set exclusively in valuable precious metals like 14k gold, 18k gold and luxurious platinum.